What to consider for fans with built-in lighting? How do fans cool us down? 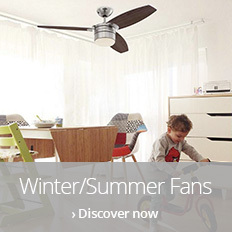 How do fans help you to save on heating costs? In which direction should the fan rotate? Can I buy a fan with remote control? Which fans are the quietest? What is the correct way to install a ceiling fan? How do I balance the blades of a ceiling fan? Are fans unhealthy – could I catch a cold? Do any of the fans have timers? Do you only have one power outlet on your ceiling? Then a fan with built-in lighting may be the right choice for you. Want more flexibility? A pedestal fan could be the perfect solution for you. Not sure what to do with your sloping ceiling? There are also special fans for this. 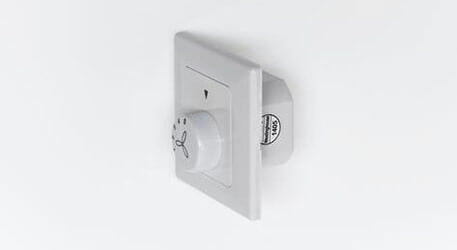 Fans are available with a wall switch or a remote control. The choice is yours! Just can’t decide which is the right model for you? Click here for our Guide to Fans. Almost everyone looks forward to a hot summer. But when it gets here, we often groan with the realisation that we can’t really spend every day lounging by the pool or at the beach. In the office and at home, a cool breeze is always welcome, and fans are great at providing this. 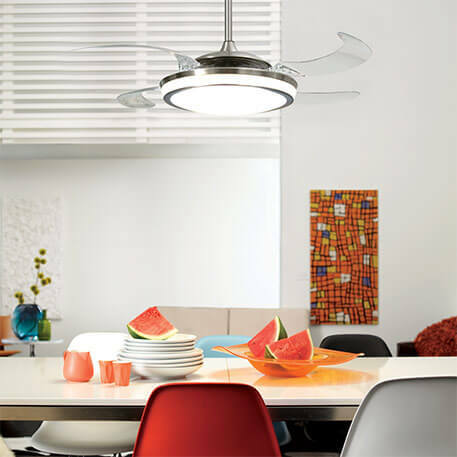 A great option are fans that come as an all-in-one solution with a built-in light. Is a cool breeze just not enough for you, or maybe you only have one power outlet on your ceiling. Well, that is absolutely no problem at all. 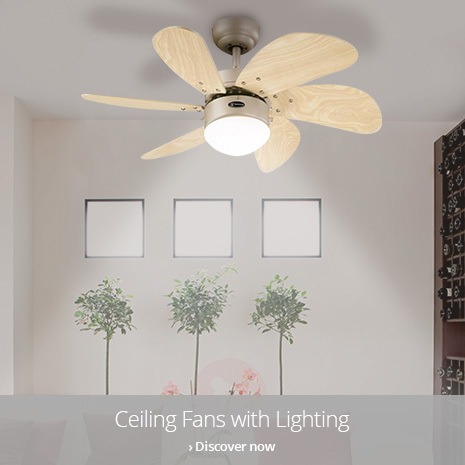 Just take a closer look at our products under the sub-heading “ceiling fans with lighting”. 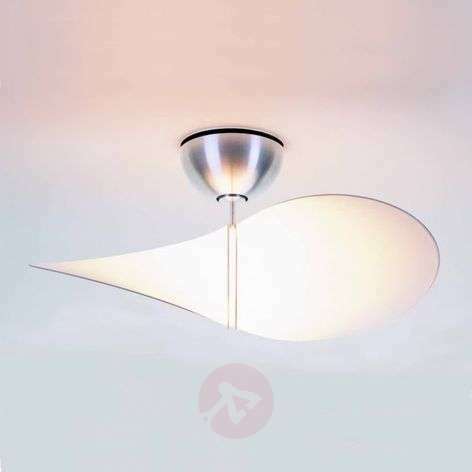 There, you will find many different fans which can provide your room with light at the same time as cooling it – and with some of them, you can even change the luminous colour. So how exactly does a fan give us pleasant, cooling air? Although it may feel like it, fans do not actually produce cold air in the same way as air conditioning units do. To put it simply, fans circulate the air, which has a cooling effect on the skin and reduces room stuffiness. ACs turn hot air into cold air, transforming the air in your house or apartment. Does this scenario sound familiar? All the warm air in the room is trapped just beneath the ceiling, and despite having the heating on full blast, you still have cold feet. By setting your fan to winter mode, you can remedy this situation and save up to 30 percent on heating costs. But it must be a fan that is explicitly compatible with winter mode. You can ensure this by selecting “With forward/reverse mode” as a search filter in our online shop. Then you will know that your fan has a lot to offer, even in the winter months. Well that depends... Are you planning to use the fan in the summer to make the room cooler or in the winter to save on heating costs? Set the fan to run clockwise and you’re ready for the summer, then change it to anticlockwise for the winter. This anticlockwise rotation helps to distribute warm air, which would otherwise accumulate just beneath the ceiling, into the room – this creates an even warmer heating effect. The choice is yours: Do you want a fan that you can adjust using a wall switch, or would you rather have a remote control? 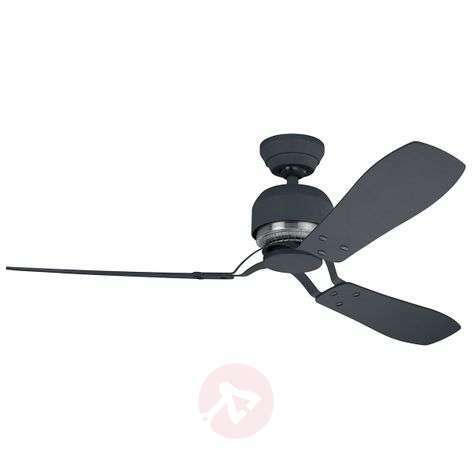 In our online shop, you can set the search filter for the type of fan you want – this will display your preferred models. 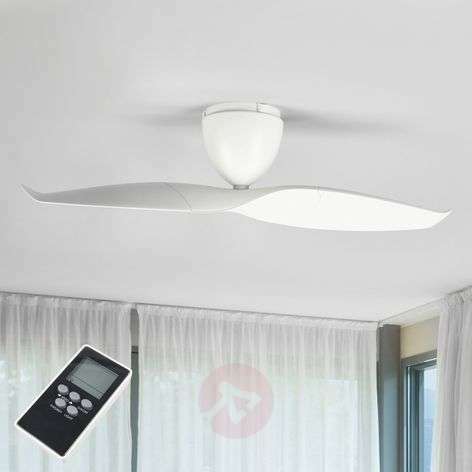 Remote-controlled fans not only give you the option to choose between speed levels, but many fans with lamps also allow you to change the luminous colour. 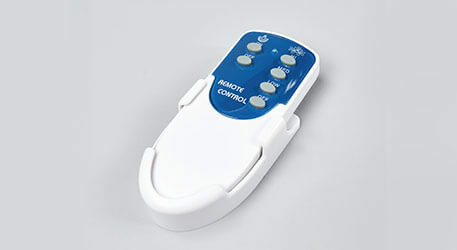 If remote control just isn’t your thing, fans with wall switches also allow you to control the fan speed. Want to enjoy a pleasantly cool summer but not at the expense of your peace and quiet? If so, it’s very important to find a quiet fan. We assure you that all our ceiling fans are extremely quiet. At slower speeds, you can hear almost nothing at all and at faster speeds, all you can hear is the movement of the wind. Many customers even use our fans in their bedrooms. Important: There must be a free power outlet available. 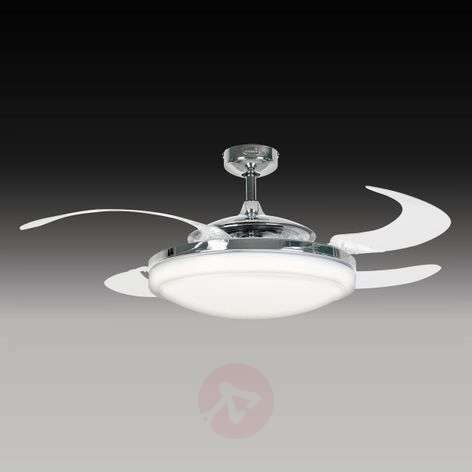 Ideally, the ceiling fan would be placed in the centre of the room and would serve as a replacement for your existing ceiling light. 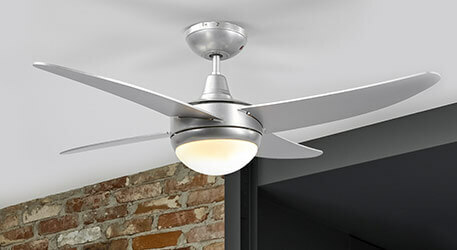 If you plan on keeping your existing light, the ceiling fan should be installed to the side of it. In this case, a separate power outlet must be installed. The product’s technical specifications will tell you whether or not a fan can be installed on a sloping ceiling. This usually works using a ball joint. 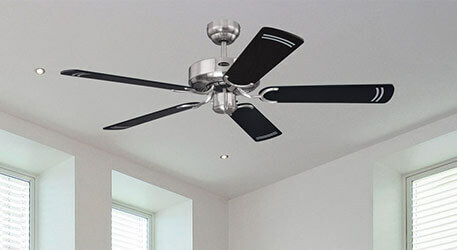 When installing a ceiling fan, there is a minimum distance that must be maintained from walls, furniture, and curtains. This distance is listed in the instructions. Roof beams and slopes can also disturb the flow of air. For a safe distance between you and the ceiling fan blades, we recommend a minimum installation height of 2.3 meters above the floor. Important: The ceiling must be able to withstand the weight of the rotating motor. The fan's weight while running is higher than when it is still. 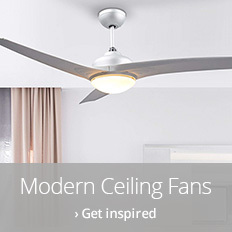 Your new ceiling fan should be left running at a low speed for a period of at least 24 hours. In the first few hours, the fan may make noises – it may even sway or rock. This should stop happening fairly quickly, but if it doesn’t, you might need to rebalance the fan’s blades. Firstly, the ceiling bracket must be firmly and evenly bolted to the ceiling. This is best checked with a spirit level. Some models have counterweights on their blades. Just attach them according to the instructions. Alternatively, coins can be used to balance the blades. In the summer, we are always happy to feel a nice, cool breeze when we’re feeling a bit sweaty. But when you have a fan, just as with an air conditioning unit, you need to limit your exposure to excessive draughts. Do not allow air to blow directly onto your back for several hours. You should always keep your distance. Bear this in mind for your bedroom: If you go to bed in light sleepwear without a blanket, you might cool down at night while your fan is still running at full speed. If you are unlucky, you might wake up with a stuffy nose and a scratchy throat. So, it is best to cover up if you plan to leave the fan running at night. Want to fall asleep in your bedroom with a cool breeze, but don’t want to wake up with a cold? One option is to set a timer on your fan. You can programme it so that once you have cooled down enough on a summer’s evening, it switches off after you have fallen asleep. This can be programmed, for example, via remote control. 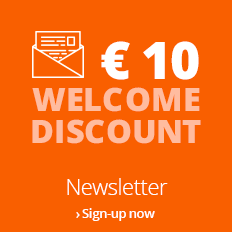 Need help finding the right fan for you? Please feel free to contact one of our specialists. 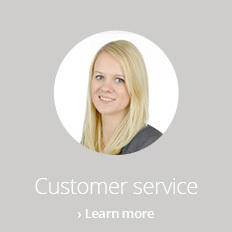 You can reach our advisors by phone on +353 1 699 2138 or via our contact form.